From the airport you can use BUS 22 which comes to the Stockman,or you can use taxi and drive to Raina bulvaris 31. 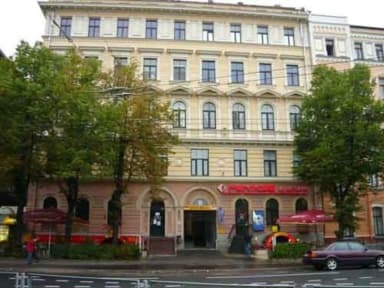 The hostel is located in one of the most beautiful streets of the city centre-Raina boulevard. Close to the shore of the city chanel. In the same building with the hostel are cheap cafes and a pizzeria. From here it is only few meters to the shops, cafes, banks, theatres and offices, while crossing the street, you'll be able to enter the Old Town famous with its unique historical and cultural heritage. Near the hostel we have city car and bus parking. The place was in a very central location. Staff was good. Bathrooms were good. Overall a pleasant stay. I stayed at Tiger Hostel for one night, I have the whole room to myself which was nice. Tiger's location is really good, centrally located near the bus/ coach station and the train station and within less than 1/2 hour walk distance you reach the Old Town. The direction to the hostel was somewhat challenging for me; do Google before hand. Once you know its location, it was convenient. During our stay the hostel was clean, and plainly furnished. The staff was sometimes hard to find but answered all questions to our full satisfaction. At the beginning of our stay we did not recieve the "usual" overview and hostel - introduction, but to be fair we also didn't ask for it at that point. All in all the hostel is a nice choice if you want to stay in Riga and exlore the old town. Our stay was as expected, or even a bit above expectiation. Staff its nowhere to be found after check in, rooms are very basic with no space for storing luggage. They're is a small kitchen with place to sit for 4 people, but like the rest of the hostel direct daylight its not available. Overall, a very basic hostel without the expected hostel atmosphere.